Ed Cirio started dancing West Coast Swing in 1970 with Jesse Naputi’s Good Time Swing Club in Alameda, California. He later took lessons from Bill Joslin, Sandy Chavez, and Frank Mannion. In November 1972 he joined the California Swing Club at the “Jolly Friars” in San Francisco and was elected vice-president. When the attendance for the dance classes grew to the point that they needed help, Frank Mannion and Bill Joslin asked Ed to teach the new beginners while they taught the advanced and intermediate classes. Ed taught at the California Swing Club for four years, then resigned in 1977 and took over Bill Joslin’s class at the “Garden Inn” in Hayward when Bill moved to Los Angeles. Ed later met Phil Trau and they joined forces in February 1978 to start the Top Of Beardsleys in Burlingame, with Kenny Wetzel’s blessings. (Top Of Beardsleys was a replica of Kenny’s Top Of The Golden West in Norwalk, CA.) In 1980 they moved to the Peninsula Italian American Social Club in San Mateo, CA and are still there teaching every Wednesday evening. In their twenty-eight years of teaching they have taught thousands of people how to dance Swing. 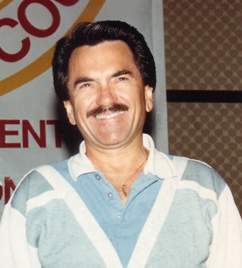 Ed was part of the original Unified Swing Contest Committee of California that was organized to help standardize competition judging in 1978. In 1985 he became a part of the United States Swing Dance Council until it closed its doors, and in 2000 he joined the World Swing Dance Council when they organized to serve the Swing dance community. Ed Cirio has been a judge, instructor, scrutinizer, and chief judge at various conventions through out the country, starting with the first U.S. Open Swing Dance Championships in Las Vegas in 1979. He worked closely for many hours with Walt Harman, a lobbyist in the Bay area who was instrumental in making West Coast Swing the official California State Dance in January 1989. Ed is currently chief judge at the Mountain Magic convention, held in November at South Lake Tahoe. He has served on the board of The Next Generation Swing Dance Club as independent director and convention committee member for three years. He received the Humanitarian Award from the U.S. Open Swing Dance Championships in 1986 and the Spirit Of Swing Award from Michelle Kincaid’s Swing Dance in 1993.